DEANNA ELAINE PIOWATY: Pam, you’ve said that art, and stories in general, offer the opportunity for release from everyday existence. The prolific novelist, Anne Tyler, once wrote, “I want to live other lives. I’ve never quite believed that one chance is all I get. 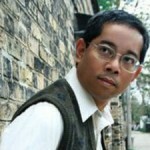 Writing is my way of making other chances.” What are some of the other lives you’ve dreamed up? Were you able to create them in a way that satisfied you? 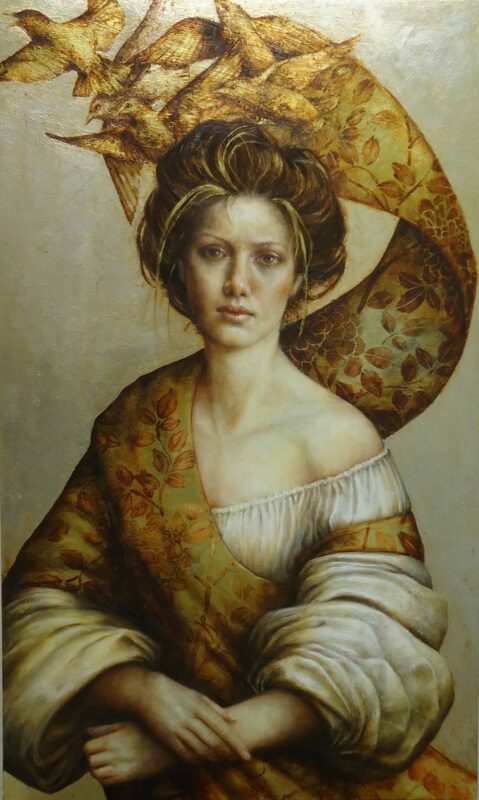 PAM HAWKES: I mainly trawl my own and my family’s life and mythologise it; but through these pretenses and imaginings, a deeper truth seems to emerge. 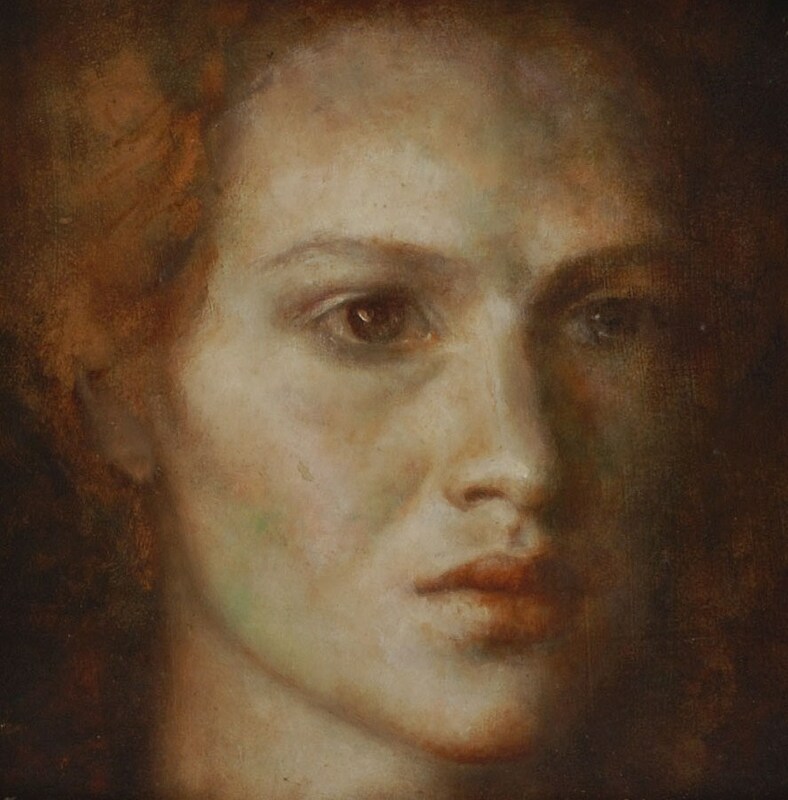 PAM HAWKES: You ask if this is satisfying and I would say sometimes it’s far too unsettling, too personal, for me to feel satisfied. DEANNA ELAINE PIOWATY: Can you give an example? 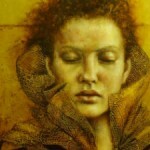 PAM HAWKES: At my first solo exhibition in London. I had been using directly my own image, and that of my children. I felt as though my own life was too exposed, I had given way too much information. DEANNA ELAINE PIOWATY: Is there one painting in particular that continues to haunt you? 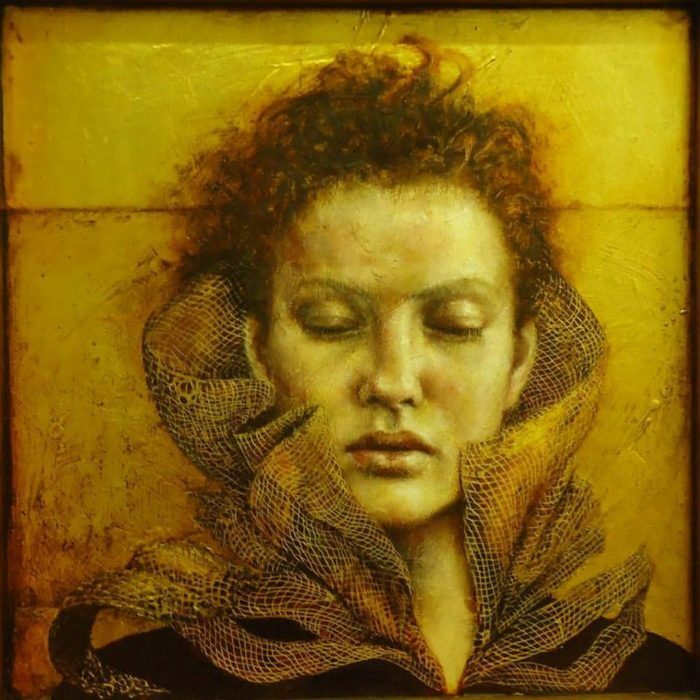 PAM HAWKES: One of my paintings does haunt me. When my daughter reached puberty, I did a large painting of her as the little girl I felt I’d lost as this new teenager was emerging. At the time I was exploring the notions of space and deconstruction of painting, and the image was of her split in half on the two opposite margins of the canvas. 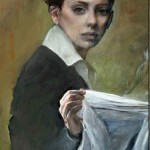 The one part of her emerging, the other side departing, and in the center was a void, just raw linen. Not long after this she became critically ill with meningitis and was on life support for three months and in a coma. 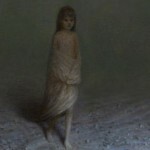 She eventually recovered, but I could not look at this painting again. I still have it, rolled up in my studio. After this, my work changed, I reduced and simplified, they became quieter and still; but through this, I think, more complex. DEANNA ELAINE PIOWATY: Do you feel that the people you paint are autobiographical or composites of people you’ve met or dream of meeting? 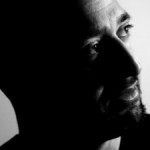 Is art, as E.L. Doctorow said about writing, a “socially acceptable form of schizophrenia”? 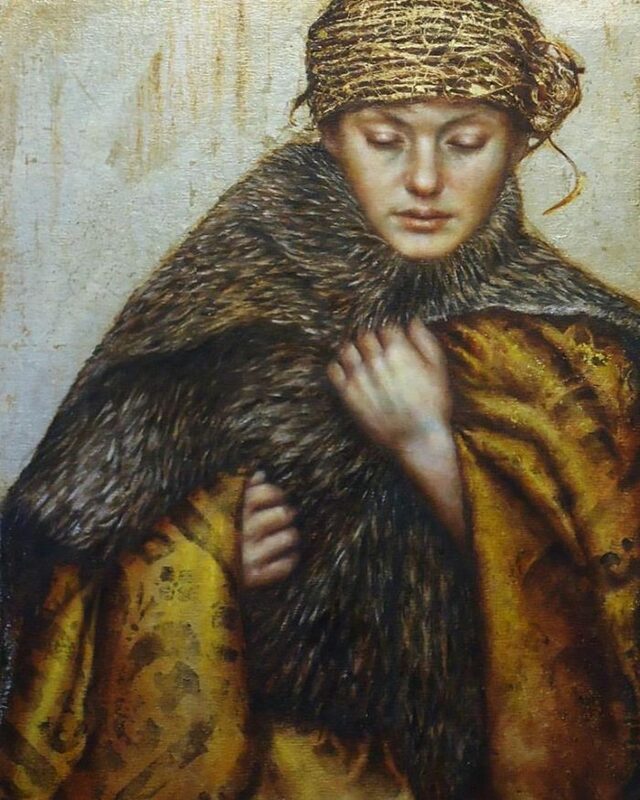 PAM HAWKES: Most of my work are composites of myself and family, but they are not portraits. 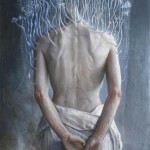 They are idealized images which draw you in, but beyond that surface beauty I try to unsettle, to question the ideal. DEANNA ELAINE PIOWATY: Can you tell me a little more about that? 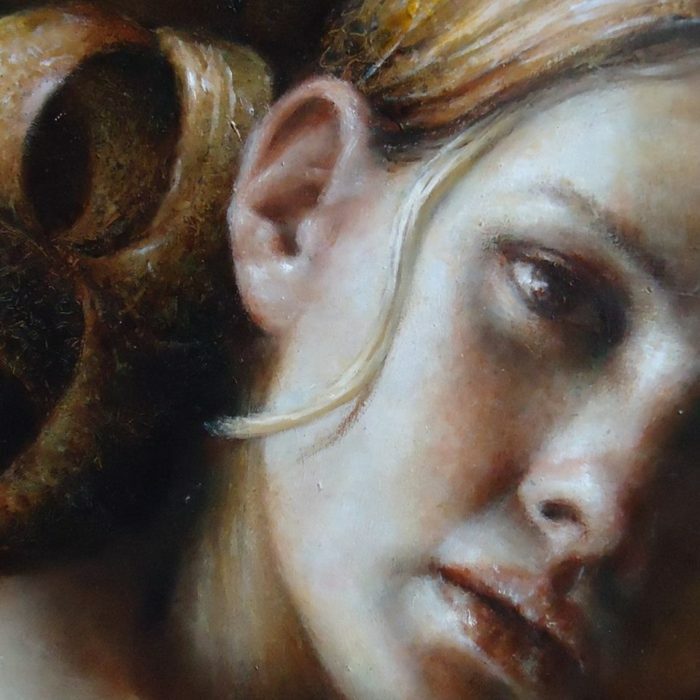 PAM HAWKES: It’s connected with my love for medieval marginalia and religious icons, my first visual inspiration. The craftsmen who painted these images were not allowed to veer from the imagery prescribed by the church; and yet these icons seem to take on whatever persona the viewer, or worshiper, needs it to be. This is heightened by the beautifully and elaborately executed frames which further separate the imagery from the mundane world. My work takes much from this, frames which I paint or gild, sometimes carrying the central image over into the frame, escaping from those confines. The use of metal leaf again comes from iconography, and the use of text which often rather than use as a way of illumination, I use to confuse or in opposition to what’s happening in the main image. 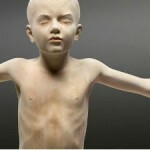 DEANNA ELAINE PIOWATY: Which would you say is the most important quality to have as an artist? A good imagination? Or superior craftmanship? 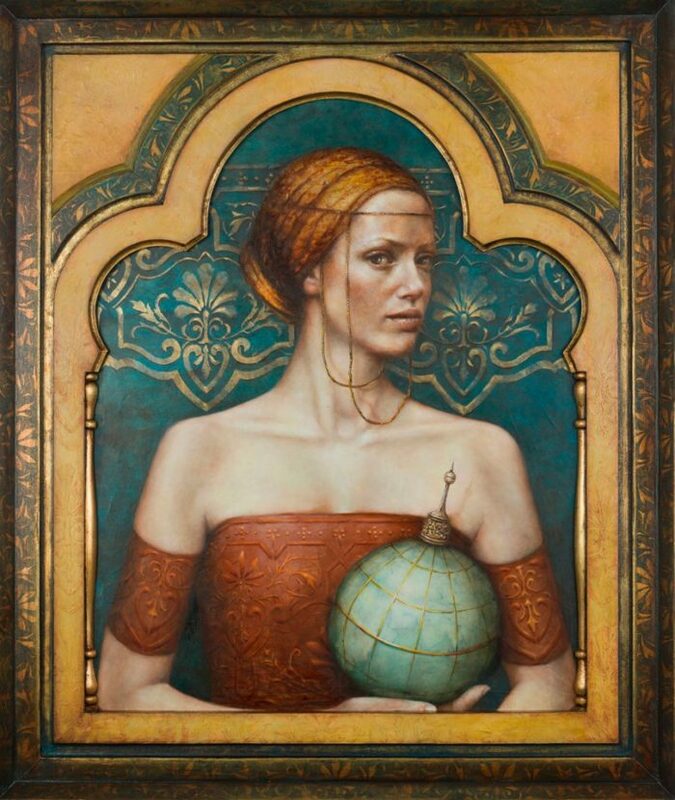 PAM HAWKES: Imagination. Craftmanship comes with practice. 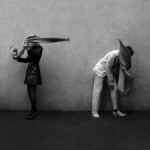 DEANNA ELAINE PIOWATY: Does optimism serve the creative process better or frustration, longing? 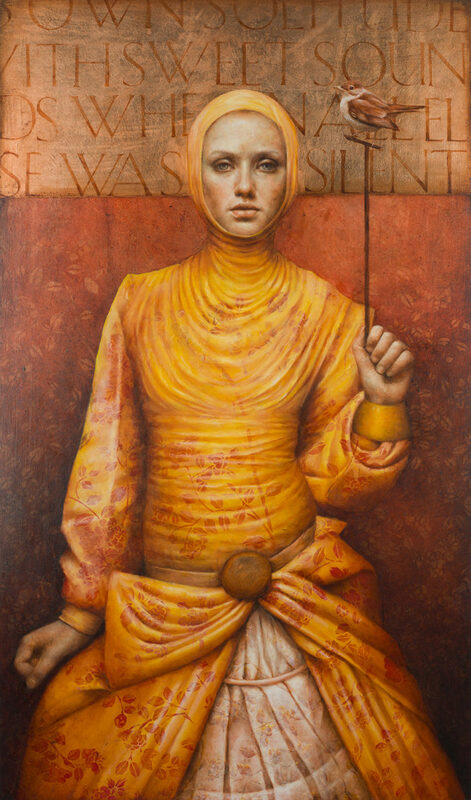 PAM HAWKES: I think if I wasn’t optimistic about my next painting, I would never paint again. Frustration kicks in half-way through. Longing, if I am away from the studio for more than a few days. I get homesick for it, I long to be there. 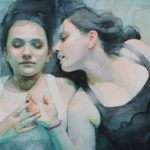 DEANNA ELAINE PIOWATY: It’s been said that you create a sort of confined environment for your subjects in your paintings; and that this reflects the sense of entrapment we all experience. How would you describe the environment of your childhood? 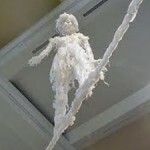 Was art for you a way of creating greater space for yourself? 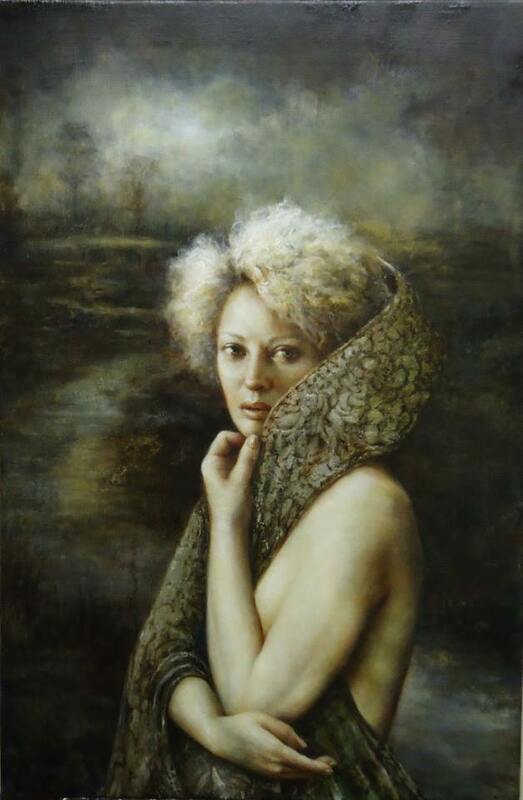 PAM HAWKES: I had a great childhood: an inner-city kid who was free to roam the factory yards and canals where I grew up. 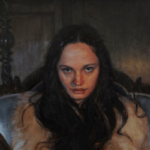 Until you asked this question, I had never made any connection to this and my constant painting of women in confined environments. A light has just gone on! 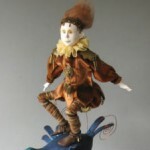 DEANNA ELAINE PIOWATY: What inspired you to become an artist? Were you always drawing as a child? 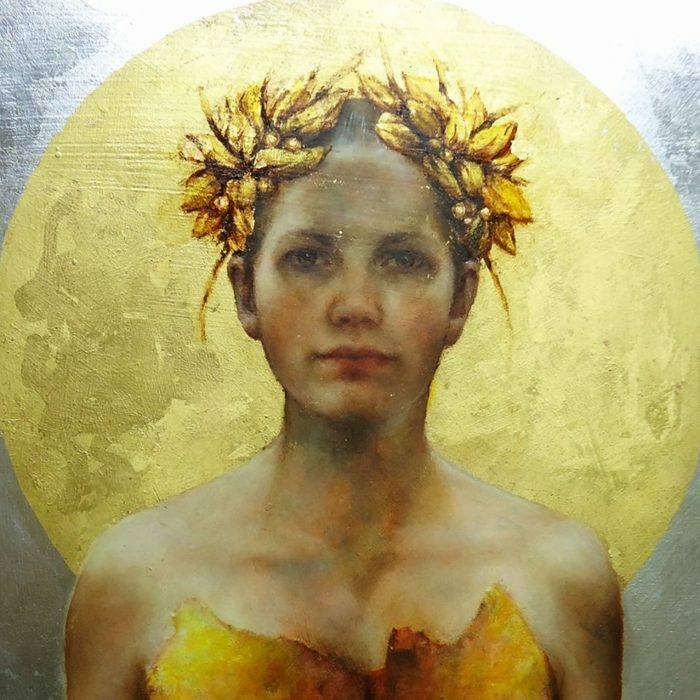 PAM HAWKES: In Birmingham there was an art school with a long tradition of training designers to go into the world-famous jewelry quarter. In fact, I was a trainee jewelry designer when I first left school. Throughout Birmingham, kids at normal schools with an aptitude for art were asked to take an art exam at the age of ten or eleven, and if you passed you were offered just one of about twenty-five places each year. My parents thought this was right for me as yes, I was always drawing or making something from a young age. So I went to an art school from the age of eleven, where the bare minimum of academic subjects were taught, but all branches of the arts were studied. 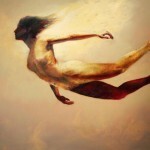 After this I drifted, and married young, but always painted. 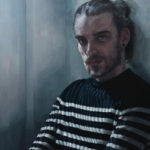 When I became a single mum with two young children and in my thirties, I recklessly went to study for a degree in fine art, and after this, my Masters. It was a tough but wonderful time; I no longer felt a perpetual outsider. I think I am a late developer! 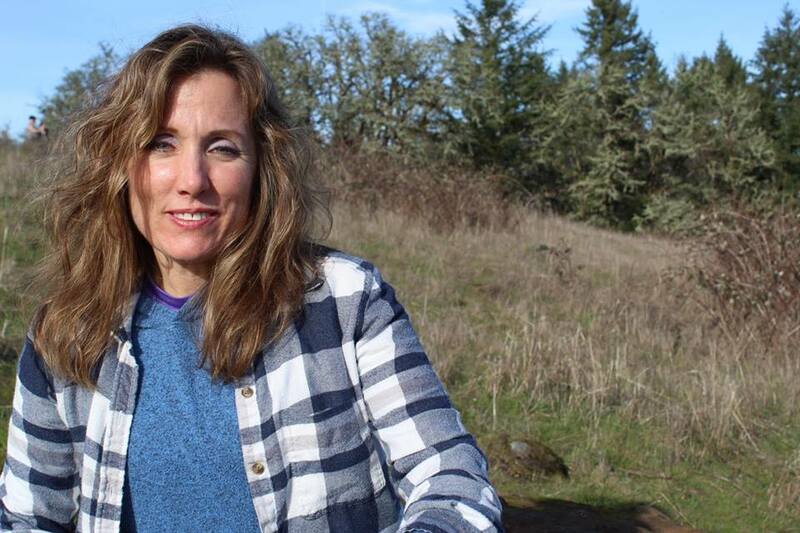 DEANNA ELAINE PIOWATY: Do you ever paint to solve a personal dilemma you’re struggling with? 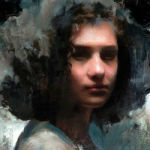 Does painting allow you to access a non-verbal, more intuitive solution? 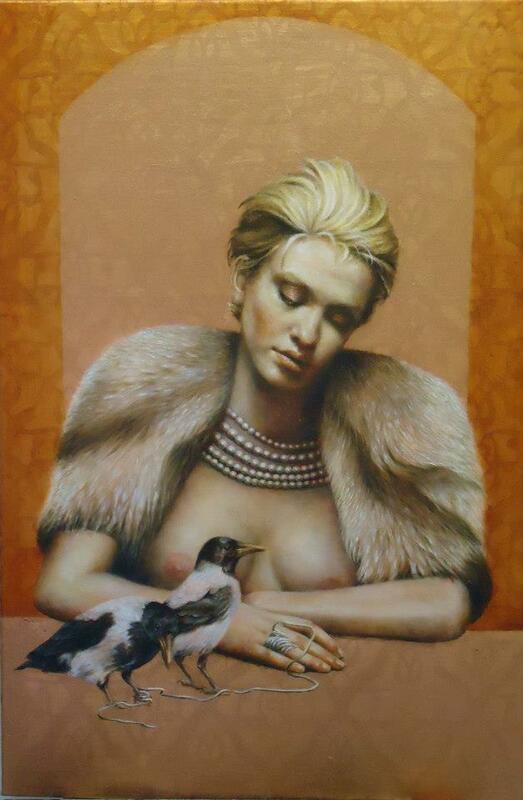 PAM HAWKES: Always, for me there is no other way. 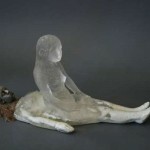 DEANNA ELAINE PIOWATY: I get the sense that you like to leave your viewer wondering, and maybe possibly also yourself. 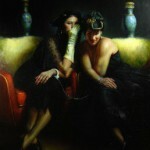 Does it ever feel to you as though your subjects know a secret they have yet to divulge even with you? 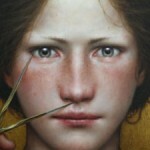 PAM HAWKES: Yes, yes! Sometimes I look back at my work and think, ‘Oh, that’s what it was all about.’ I feel that I have failed when they have become too literal or illustrative; I know that’s my weakness and I fight it. 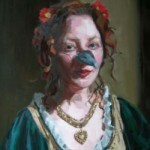 DEANNA ELAINE PIOWATY: Has a painting ever given you so much trouble that it almost became a battle of wills? If so, did you toss and start over? Or wrestle with it until you arrived at a pleasing solution? 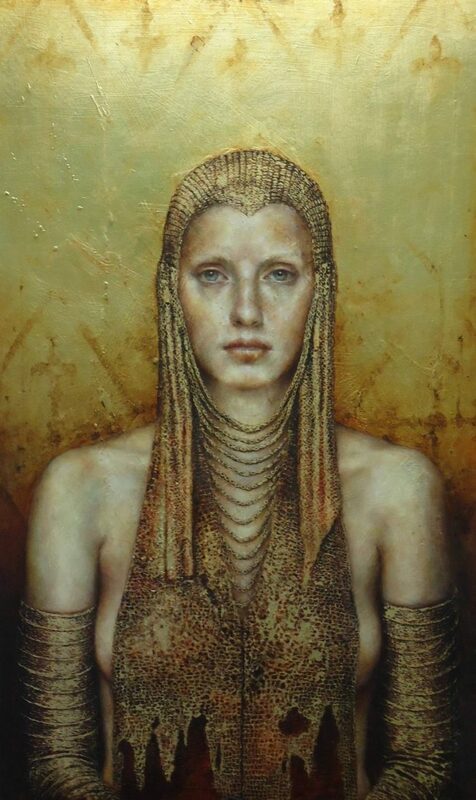 PAM HAWKES: Yes, especially over the last two years I have struggled with many paintings. On the whole, I do wrestle, nothing seems to come easy; but I very rarely give up on a painting, and I eventually let it have its own way. 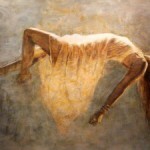 DEANNA ELAINE PIOWATY: How do you prepare for a painting? Do you research? 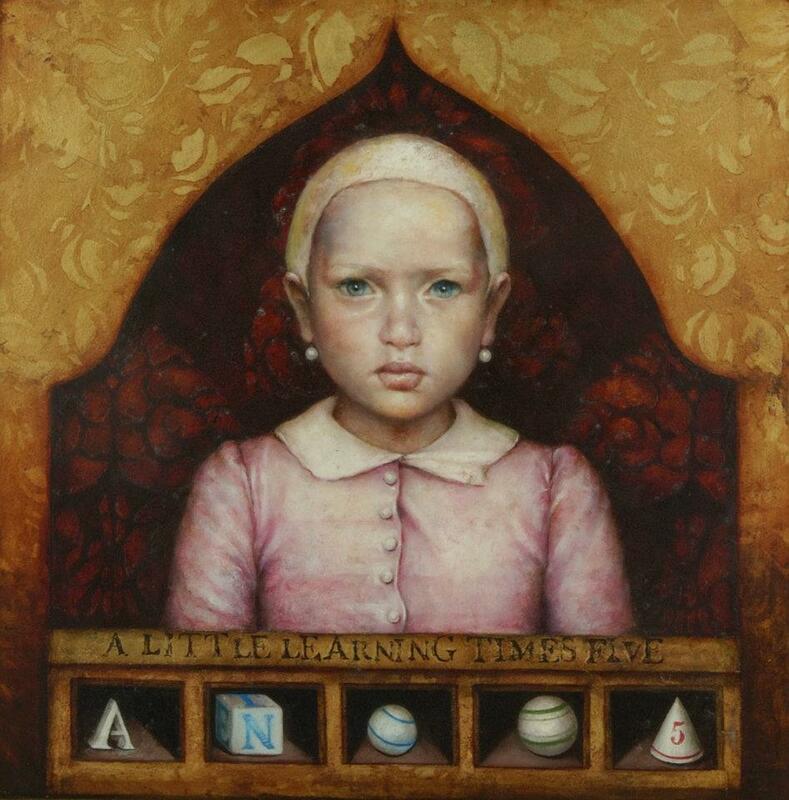 PAM HAWKES: I go against everything I was taught, and have taught. I rarely do research or preparatory drawings. I don’t even draw on the canvas or board. I go straight in with half an idea and work it out as I go along. Not to be recommended. Paintings take me far longer than they should, as they are constantly evolving. DEANNA ELAINE PIOWATY: Are you ever concerned you will run out of ideas? 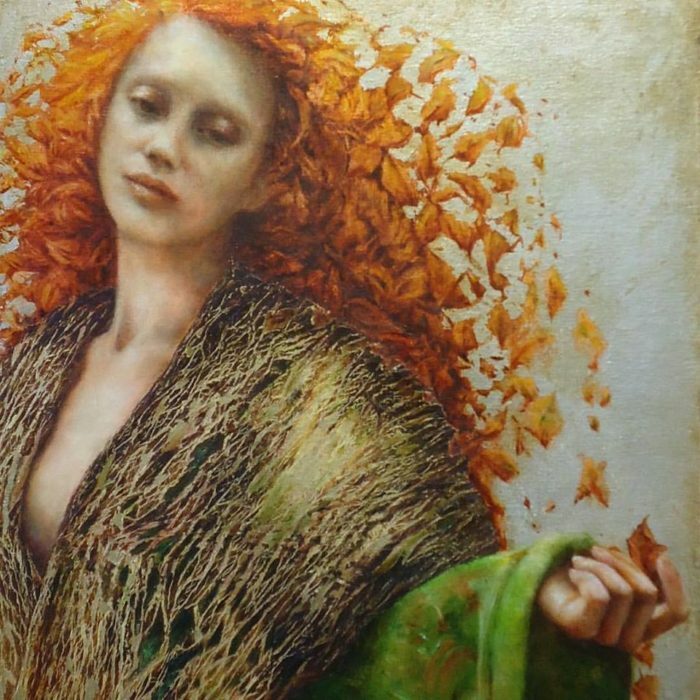 PAM HAWKES: All my work seems to follow from one to another. As I’m working on one, something else comes into my head, and that’s the next painting. 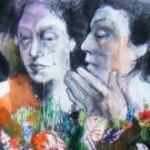 Consequently, I have four or five paintings going at any one time, along with notes of other thoughts in a journal. These can be quite long rambles, or scraps of sentences that I have read or heard. When I re-read these I am always inspired; hopefully this will always be so, don’t worry about it too much. DEANNA ELAINE PIOWATY: Do you think of your viewers while you’re working on a piece? Or do you paint primarily for yourself? 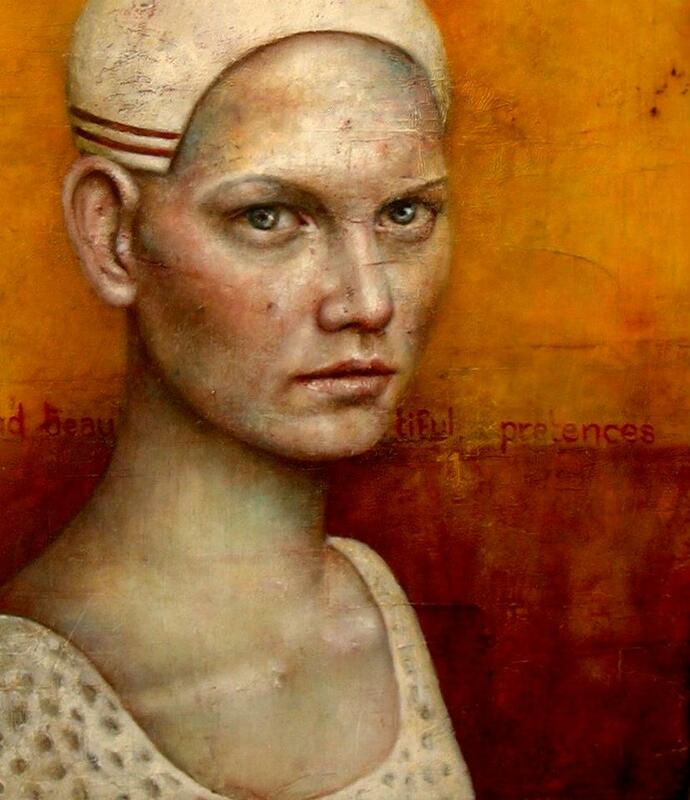 PAM HAWKES: I can’t possibly know what a viewer will think of my work, nor should I try. 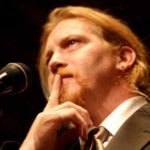 I have to keep in mind, however, that it will one day be ‘out there,’ so I have to constantly question my work as objectively as I can; otherwise there can be a danger of becoming self-indulgent. DEANNA ELAINE PIOWATY: Your definition of ‘beauty’? 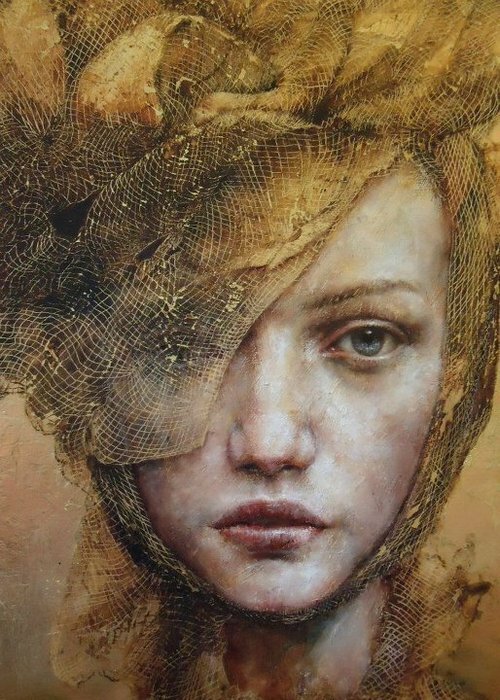 PAM HAWKES: Surfaces that I want to stroke, touch or lick. 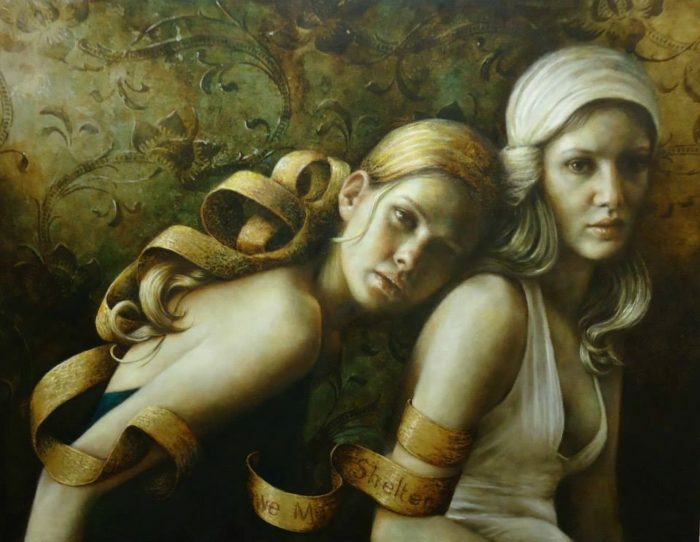 Thank you for writing this article and interview on Pam Hawkes. She is one of the most talented artists working.